Consider the olive . . . then make some olive bread! Consider the olive. Please. 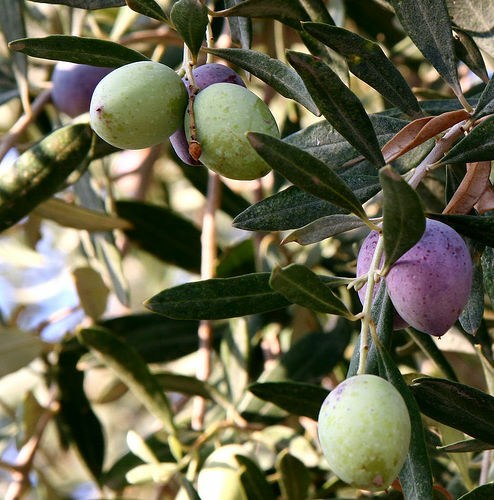 This tiny, tasty, oil-rich fruit of the olive tree is of primary importance in the world because of its obvious connection to the highly-desirable oil it produces. Ironically, though the oil is used widely, and universally admired, oftentimes the fruit is avoided because of its high fat content! Isn’t that ironic? I think it is. Ironic. Not to mention silly. Guess what that fat in the olive is? It’s olive oil. Now aren’t you glad you happened upon this site today, my Gentle Reader? Here we go. Fasten your nutritional seat belt, baby, because once I’ve laid out a bit of olives-are-good-for-you-facts, then I’m going to share an awesome (I’m not using that word carelessly here, either) recipe for Olive Bread. And no, bread is not poison, either. That’s another dietary fad that will be gone in a few years, I believe. But I guess we’ll just have to wait and see on that one, eh? Meanwhile I think I’ll toast myself a piece of this excellent olive bread . . .
Oh, this stuff is so delicious it ought to be against the law. Boy! Is it a wonder that we’re all really confused when it comes down to it? What do all the diet books say? Monday: Eat TONS OF CARBS! Tuesday: Oops, my mistake, carbs are BAD, very very BAD! Sooo EVIL! Wednesday: EAT lots of fat and meat and eggs and whatnot! Just pile that bacon onto that hamburger patty, no problem!! Thursday:Uh-oh, we were wrong, watch that fat intake and for pete’s sake no more than one egg per week! Friday: Guess what? Green smoothies are the answer!! Well, actually I do agree that green smoothies are the answer, no argument with that! Saturday: Eat agave! Sunday: Agave is poison! Monday: Try the baby food diet! Tuesday: The baby food diet can kill you! and so on and so on . . .
1. Olives are good for your heart health, and–with their high monounsaturated fat content–can actually help lower your blood pressure. This is a good thing, and particularly important in the Western world, where heart disease is such a big killer. When diets that are low in monounsaturated fat are changed to increase the monounsaturated fat content (without becoming too high in total fat, mind you), research study participants typically experience a decrease in their blood cholesterol, LDL cholesterol, and LDL:HDL ratio. All of these changes lower our risk of heart disease, not to mention a bunch of other bad stuff. 2. Because of their high fat content, olives can actually help you lose weight. I know that sentence sounds a bit conflicting. But hang in there with me. Studies have shown that people who eat olives every day eat fewer calories overall, suggesting that the fat in the olives make them feel full longer. I’ve discovered the same thing my bulletproof coffee habit. My morning cup of bulletproof coffee, laced as it is with butter and coconut oil, keeps me satisfied and full all morning long. Not to mention very, very happy, but that just may be the caffeine . . . Olives have the same effect of creating satiety. 4. Here’s a lovely-skin hint for you, Gentle Readers: You can gain a healthy, glowing complexion by washing your face in warm water, applying a few drops of olive oil to problem areas, and letting it work its magic for 15 minutes before rinsing it off. Or just leave it on overnight . . . though you may want to not use your favorite pillow case that night. Your skin, your hair, and your eyes can all benefit from the nutrients in olives. Black olives in particular are rich in fatty acids and antioxidants that nourish, hydrate and protect. Chief among those is vitamin E.
Are you ready yet to go to the grocery store and pick up some olives? You can learn lots more about the healthy effects of making olives part of your daily diet by reading this article, published on the Health Impact News Daily Website. And after you do that, you can mix up some olive bread with a light, happy heart. And then you can eat it. Without a modicum of guilt. From the recipe, I’ve split the dough into four balls, one of which is rolled out flat with chopped olives spread on it. The middle ball is ready to rise, and the two on the left are not formed yet. 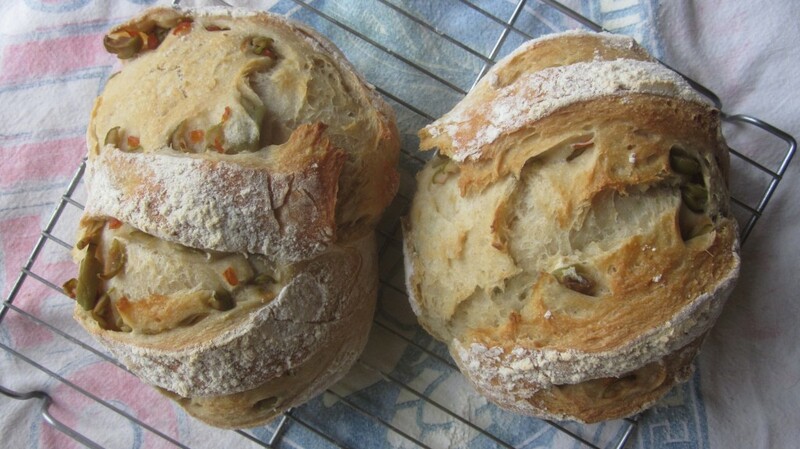 Consider the olive and make some olive bread! Olive bread is good in so many ways: slathered with cream cheese, toasted and schmeared with butter, even spread with honey! Mix yeast, salt, sugar and olive oil with water in a bucket with a lid. Mix in the flour without kneading, using a mixer or a big spoon. Cover (not airtight) and allow to rest at room temperature until dough rises and collapses (flattens on top), approximately 2 hours. Put into 'fridge at this point, or make your bread right away. To make olive bread: divide dough into four pieces, and roll out one piece ½" thick. 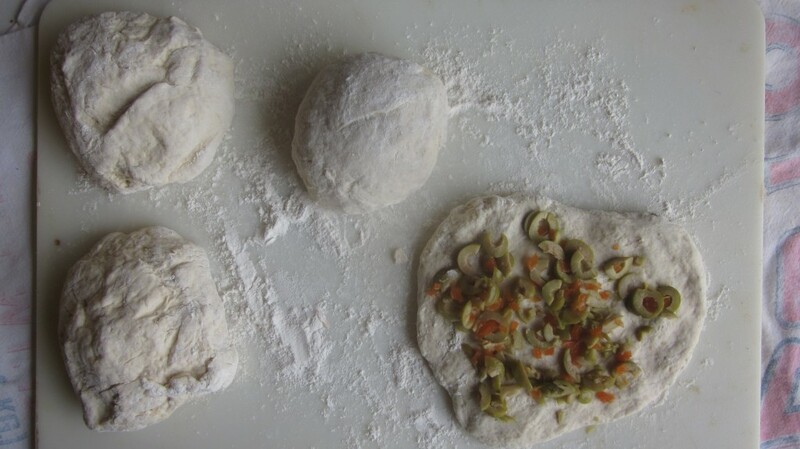 Spread ¼ cup chopped olives onto the dough, roll up and form into a round loaf. Repeat with other three balls of dough, and put on parchment-lined cookie sheet. Let rise 60 min. Preheat oven to 450 degrees, putting pan of water in bottom of oven, and a baking stone on the middle rack. Slide parchment paper with loaves on top, off cookie sheet and onto hot baking stone. Let bake 25-30 minutes or until golden brown on top and firm on bottom. Let cool on racks (if you can control the gathering hoards who will insist on cutting into it, hot--back!! Back!) and then slice and eat! 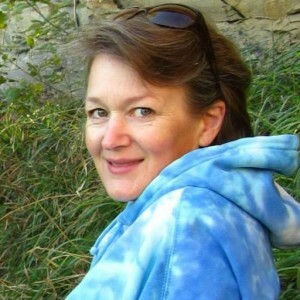 I’ll be sharing this post with the nice folks at The Prairie Homestead Blog Hop and also over at Frugally Sustainable. When you’re finished with all the curtseying and bowing to your friends and family over this fabulous bread, come on over! Well, I certainly agree with you about olives and olive oil being one of the best choices you can make! For me, though, bread can be like crack – highly addictive! Doesn’t matter how healthy the ingredients, I have to ban bread and sugar in order to keep my eating in control! Jeanne, well, maybe just skip the bread and enjoy the olives, then? My cooking does not include cakes, breads, or pies. (OK, maybe one of them every six weeks or so.) But, olives? Try baking a nice fish with tomatoes, olives, and jalapenos. Now, that’s a tasty dish. Oiy, all that sounds quite scrumptious, Roy! You made your own marinated olives, Anita-Clare? Yum!! I love olives. Green ones are my favorite. I have never had olive bread so will have to try that. Up north were we are from there was such a creature called an olive burger. Regular hamburger then there was this heavenly mixture of olives, mayo, some mustard, must of been some vinegar all mixed together and slathered on top of the burger with a nice crusty bun. Oh my! But down here in Texas they have never heard of such a thing. I try to make it at home but I just can’t get down all the right ingredients in that heavenly olive mixture. I wonder if that wonderful olive mixture was tapenade? Does this sound familiar? It does sound delicious, Shawn! Now you’re gonna have to re-create it and share it, Shawn! My mouth is watering! I have always enjoyed olives, and made chopped olive sandwiches as a kid. But the bread does look like it should be on my kitchen table, so I’ll need to see what I can do about that. Oh your table, in your freezer, in your hand. It’s good lots of places, Chef! Being married to a man of Italian heritage, my diet has included olives and olive oil for many years. I love olives! Another recipe pinned to my Favorite Recipe board, hurrah! Oh, enjoy some soon, Alana. I’ll bet your Italian hubby will like it! Your bread looks wonderful. Encouraging to know how healthy they are. I am guilty of having tried to avoid them due to cals but yes, they are satisfying, and prob a good snack choice! I like the way you think, Vickie! We use Olive oil in our pizza crust… I also use it to fry eggs and many other things. I made this and it was AWESOME! So simple but yet soooo good! Thanks Amy, for your great bread recipes! I’ve been trying them all. 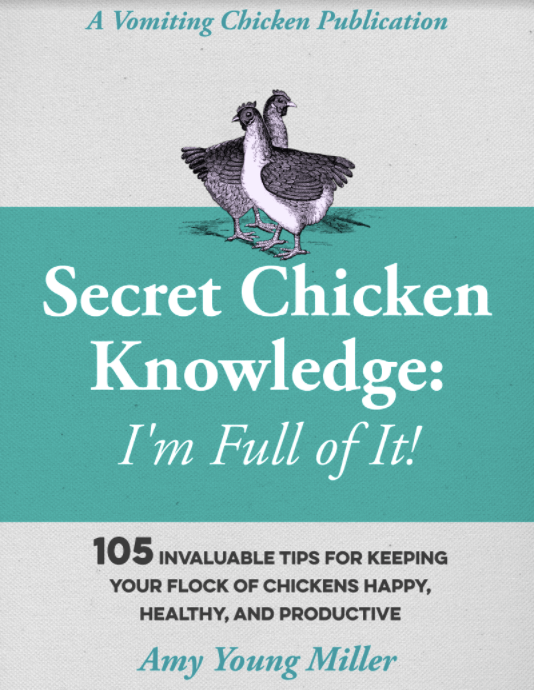 Anymore hiding in your pocket that you might want to share with us? Can almond flour be used for this recipe? I’ve never tried it, Shawnnee, but why not? Maybe start with half Almond flour and half wheat flour, and then see how it works? Using all almond flour might make for a rather tough, flat loaf, since there is no gluten in Almond flour (that’s what makes wheat dough stretchy and allows it to rise nicely).